In January 2018, inspired by a bit of tweeted Presidential Poetry, I composed a verse to the tune of Gilbert and Sullivan‘s I Am the Very Model of a Modern Major-General (from The Pirates of Penzance), and tweeted it. Later, I composed another verse and tweeted that. Jim Infantino[*] was inspired by those and tweeted several additional verses. Some other local songwriters followed suite. Over the next few days I composed a couple of concluding verses. The following is the complete collection of verses as submitted, with credits. The first part is my preferred set of verses, but feel free to substitute any of the “Alternate Fact Verses” if you like them better. [*] Jim dubbed the song “The Pirates of Pence’s Pants” – I prefer the more archaic spelling. This is an older song, but a new video. Performed March 12, 2017 at the PCA Open Mike, in Westford MA, as part of a special tribute evening to local singer/songwriter/promoter/all-around-good-person Ellen Schmidt. A seasonal song. I wrote this at the tail end of the winter of 2015 (the winter that the Boston area got 108 inches of snow). However, it’s relevant to any winter with snow, so I like to pull it out around February/March. This is a video of a performance at the Club Passim Open Mic on March 9, 2017. UPDATE 12/15/17: This link describes a simpler method for installing the Google Play store on the lastest Amazon Fire tablets. I’ve tested this on a new Fire HD and it does work. I’m leaving the description below for reference. If you use the MailChimp service for your email list, MailChimp provides mobile apps which let list subscribers type in their information at a show – a vast improvement over trying to decipher email addresses scribbled on the traditional paper signup sheet. But, you may not want to risk taking your expensive iPad or $250 Samsung tablet to a gig and risk having it dropped, or worse having someone walk off with it. What if there were a good quality tablet which was inexpensive enough that you didn’t have to worry about taking it a gig? It turns out there is: the 7″ Amazon Kindle Fire can be purchased for as little as $49 – less if you buy multiples. And it turns out that the Fire Tablet is quite fast, with an excellent quality display and s responsive touch screen; fully capable of running this sort of app. If you need a larger tablet there are versions with an 8 inch or 10 inch display, still less than the price of a comparable Samsung. The only issue with the Fire Tablet, and the reason it is so cheap, is that Amazon wants to lock you into using their apps, and the ones you want are probably not available on the Amazon app store. 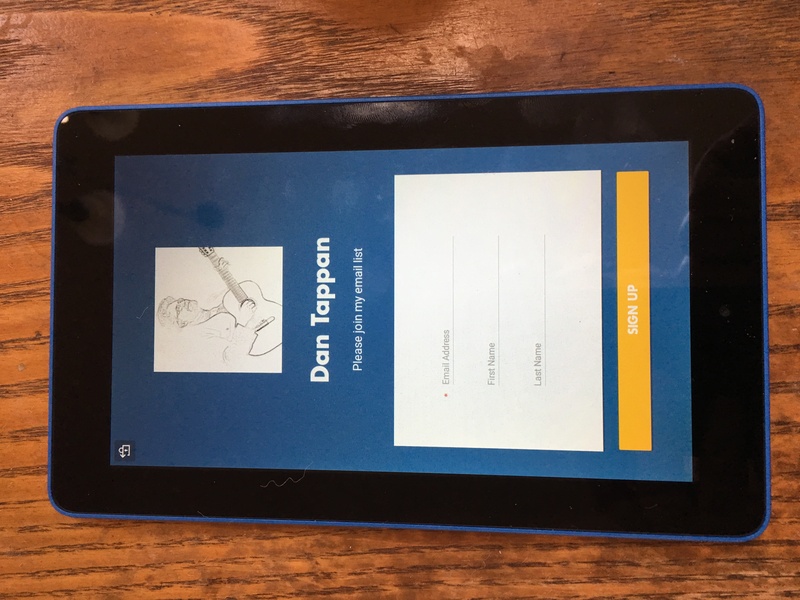 But, for musicians with a bit of a technical bent, it turns out that it is possible to install the Google Play store on a Fire Tablet, which then allows you to install any app which is available for Android. Unfortunately it’s not a completely straightforward process, but it can be done in less than an hour, and after you’re done you will have a $50 “disposable” table that you can take to a gig without worries. The following information is collected from various sites on the web. Much of this is from the “Method 2” described here. A Windows PC (unfortunately I haven’t been able to find a procedure that works on a Mac) running Windows 8 or 10. There’s a pretty good chance this would also work with a Windows 7 PC, but I haven’t researched how to turn off device driver signing under W7, see below. A USB A->mini cable to connect the PC to the Fire Tablet. One of these will come with the Fire Tablet if you buy it new. 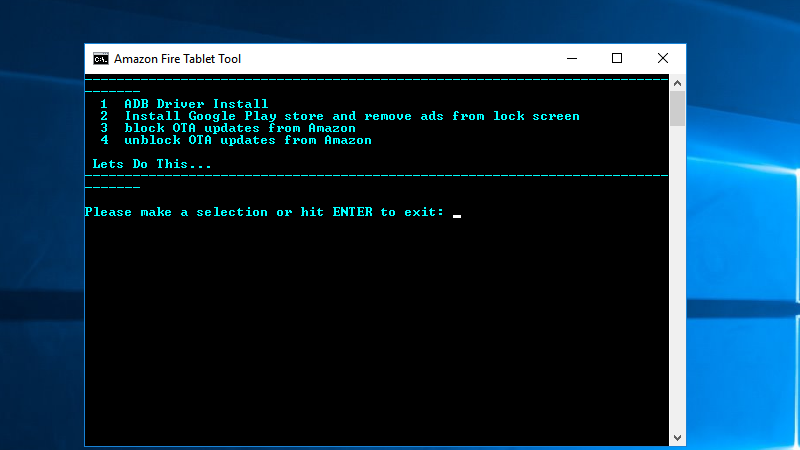 Next, you will need to do the following steps to enable the “ADB Debugger” on the Fire Tablet, which will allow the PC to download new software to the Fire. From the Home screen on the Fire, scroll down and tap the Settings app (the icon that looks like a Gear). A new menu option named Developer Options should appear beneath Serial Number. Tap it. Next, on the PC, you will have to temporarily disable device driver signing. If you do not do this then step 7 below will fail. Warning: this is the most techy step. If your PC is running Windows 8 or 8.1 follow the instructions here.If it is running Windows 10 follow the instructions for “Solution 1” here.If you are running Windows 7 there may be an equivalent procedure, but I haven’t researched it yet. Next, you need to download a utility package to the PC to install Google Play on the Fire – click here to download. Connect your Fire tablet to your PC with the micro USB cable. Extract the contents of Amazon-Fire-5th-Gen-Install-Play-Store.zip file to their own folder. Launch the batch file named 1-Install-Play-Store in the folder. When the program finishes loading, you’ll see a menu like following. Type 1 for “ADB driver install” and press Enter. On the next screen again type 1 for“ADB driver install” and press Enter. This will bring up the PC device manager screen: right click on the “Fire” device, that should be in the device list, and select “Update Driver Software…”. Select the “Browse for drivers on my computer” option, Browse to the folder ‘usb_driver’ in the extracted .zip folder, and complete the installation. At this point you should see a Confirm Dialog on the Fire Tablet, asking if you want to allow the PC to access the debugger. Say ‘Ok’. After the installation is finished, you should be back at the main menu of the PC tool. (Optional) Type 3 for “block OTA updates from Amazon.” This will prevent an automatic update from breaking your apps. Once you’re finished, restart your Fire immediately. After this, you should find a new “Google Play” app on the main screen of your Fire. Run that, log in with your Google account, and then download whatever apps you need. Over President’s Day weekend I attended the 2017 WUMB Winter Acoustic Music Weekend, and had the pleasure of having Jackie Damsky accompany me on violin on one of my songs (Abraham). On January 22, 2017 I was the featured performer (1/2 hour set) at the PCA Open Mike in Westford MA. The other day, I went to the open mike at Club Passim, in Cambridge, and played a couple songs accompanied by the wonderful Jackie Damsky on violin: Only Autumn Knows, and Potatoes in April. As long as I’m posting demo recordings of recent songs, this is a live recording (at WUMB SAMW) of “Follow the Butterfly”, a tribute to the late, great, songwriter Dave Carter. This was written as an assignment in a songwriting workshop with Bob Franke. I probably should have posted this a week ago to honor Dave’s birthday on August 13.